... and you know what? I don't think it was enough. That's the stack of games I finished last year. Several things to mention, Halo and Perfect Dark are missing as I played the Xbox 360 digital versions of those games. While the Metroid Prime Trilogy is in the picture I only finished Metroid Prime but not 2 or 3. Peace Walker has an extra chapter to play through after the credits roll so your mileage may vary whether I finished that game or not. In total, I finished 27 games last year, my personal best. Usually I finish about half or a little less than that number. 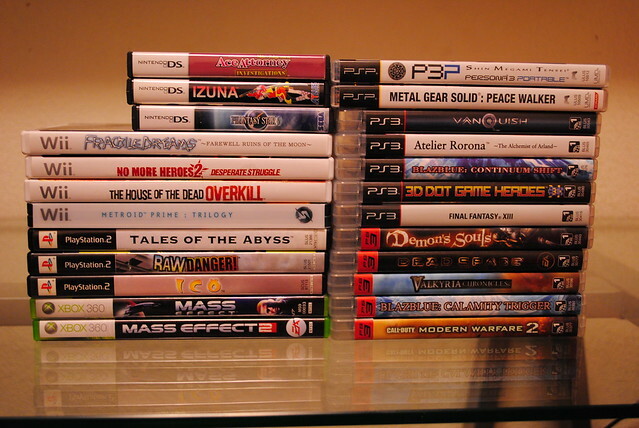 However, most of those games I bought this year but that's not all of the games I bought. Just take a look a my loot posts and see how many games I bought last year. Plus, I have literally hundreds of games in my backlog. My backlog spans at least three generations, both consoles, handhelds and PC. The games spread across seven different consoles and three different handhelds. That's why I said even though I never played as many games in one year before it was not nearly enough. I seriously own and buy too many games. I wonder though, how much more would I buy if I didn't buy figures as well.